IN an invitation by the Indian Government, six cadets and an officer of Bangladesh National Cadet Corps (BNCC) participated in “Yachting Regatta Camp-2009, Orissa” under a youth exchange programme (YEP) of National Cadet Corps (NCC), India. We, the cadets were from six different educational institutions of Bangladesh; CUO Faysal from Dhaka Commerce College, CUO Humayun from Rajshahi University, Sergeant Rajib from Rajshahi College, Sergeant Saifur from Shahjalal University, Lance Corporal Iftakhar from Comilla Victoria College and I from Dhaka University. Our only officer was Squadron Leader Noor Sobhan Talukder from Bangladesh Air Force. We departed from Dhaka on the third of February. At Benapole, the members of Bangladesh Rifles (BDR) welcomed us and helped to finish the immigration formalities. We rested at the BDR rest-house for a while. Then, we went into India crossing the zero line. Being my first foreign visit, it was an exceptional feeling for me. We changed our dollars into rupees at Petropole land port of India. Then we started our journey for Kolkata. All of us dressed in the same attire. This is why, on the way of going to Kolkata the people were looking at us with curiosity. “Are you football players? Are you going to attend any conference?”- These were the questions we were asked by the local people to know the purpose of our journey. We laughed hearing their questions. Then we expressed our objective of visiting. We reached Kolkata at dusk where Pulok da, the guide of NCC, India, welcomed us and took us to the hotel. We visited some scenic areas of Kolkata the next morning. The famous architectural landmarks heightened the sense of history, culture and politics of the city. Later, we set out for Orissa, were our guide took us to the Panthanivaas motel at the Barkul district. The hillside landscape was beautiful in the night light. Staying at Panthanivaas, people can enjoy the beauty of Lake Chilka and the hills beside the highway. We were taken to camp area of the naval base “INS Chilka” later on. Here we were introduced to the Indian cadets. There were 17 directorates in NCC. Total 102 cadets of 17 directorates participated in “Yachting Regatta Camp-2009”. All the cadets were to take part in swimming test. We passed that successfully as we were trained prior to our visit at “BNS Shaheed Moazzam” in Rangamati. All cadets participated in yachting practice at Lake Chilka. The locals claim Lake Chilka as the best lake in Asia. It is connected with the Bay of Bengal. There are some islands in it with attractive names such as “Breakfast Island”. “INS Chilka” is conceiving a different kind of view and beauty of Lake Chilka. We took part in the cultural functions in the evening. They were amazed at our performances especially by the singing of the CUO Humayun. We visited Puri sea beach after that. Its length is only 4-6 kilometers, and many people come here everyday. Marine Drive Road, shopping malls and many hotels have been built for the travelers. After then we leave Puri for Konark through Marine Drive Road of Orissa. The road is made through the forest of Orissa and beside Bay of Bengal. We enjoyed the extra-ordinary beauty the place while traveling on this road. We visited the Sun Temple at Konark. It is one of the world heritage sites of India. We were surprised such excellently designed temples. 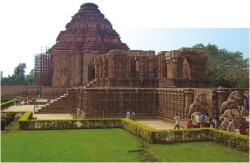 Then we came to the Temple City Bhubaneswar and were delighted by the sites of city. We were happy with the NCC authority at their arrangement of food and accommodation. We didn't face any kind of problem of mixing with the Indian cadets. In the evening we did our Bangladeshi cultural programs practice daily. A gaudy cultural program was held at the naval auditorium of “INS Chilka” on 10th February. We presented a song and a dance. Our presentation was well appreciated by the officers and cadets. The chief guest of the program was the Additional Director General of NCC, India Rear Admiral Anand Iyer. He also attended the closing ceremony on February 11. Formally, he met with us on that day. We were given crests. We gave crests to Indian officers and various gifts to the cadets and told good bye to them. We came back to Kolkata on 12th February. We did journey on the Metro Rail, visited NCC naval unit of Rabindra Sorobar and spent our time doing shopping. On February 11- we left Kolkata in the morning and returned to Dhaka at the evening. Finally, we came back and stepped on our motherland acquiring knowledge and cumulating some excellent memories.